Sheila Swafford invites everyone to her Stitchin’ Time & Tea open house Saturday April 27 from 2-4 p.m. Her new tea room is located at 120 W. South St. behind Cross Life Full Gospel Church in Hillsboro. Nestled behind the Cross Life Full Gospel Church at 120 W. South St. is a new business that takes one back to an earlier period when 4 o’clock in the afternoon meant it was time for tea and a light dessert, and women wore elegant hats and dresses with white gloves. Though she got the “tea bug” five years ago, her love for being a seamstress came from a lifelong love for sewing and the 15 years she spent in long-term care working at both Crestwood Ridge and Bell Gardens Place. 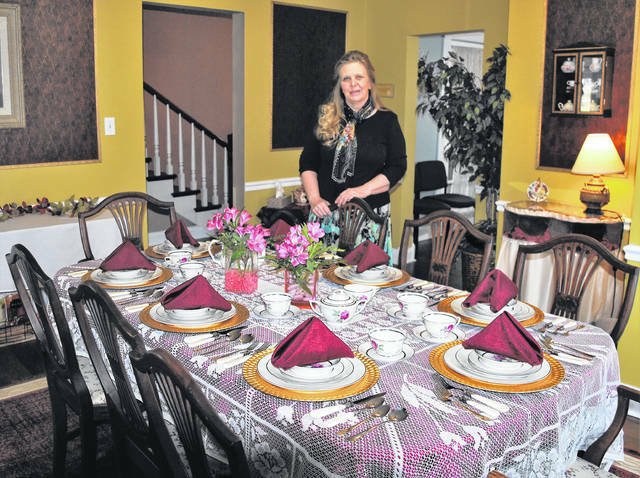 But it was through one of the administrators at Crestwood Ridge that Swafford was introduced to the tea room, when she and other members of the management team went to one that a lady from Hillsboro had in her house. She said she wanted to create an environment that was calming and pleasant where people could come for meetings and simple social gatherings, with lots of good food and conversation, unlike what she said is found in most restaurant establishments, which is loud music, televisions on the walls and so many loud and different voices that it’s difficult to think. According to author Cynthia Kuhn Beischel in her book “Lost Tea Rooms of Downtown Cincinnati: Reflections & Recipes,” it was a different time in the late 1950s and early 1960s when ladies wore gloves, hats and nice attire to attend luncheons in the Queen City’s affluent suburbs or when they went downtown. Department stores like Shillito’s provided a cosmopolitan atmosphere for its patrons, WLW’s “Good Morning Show” hosted by the late Bob Braun was broadcast from McAlpin’s Tea Room, and women gathered at Pogue’s and Mabley & Carew’s tea rooms to celebrate birthdays as well as wedding and baby showers, over dainty tea sandwiches. Swafford said she is using Harney & Sons as her tea supplier, an international tea importer now based in Millerton, N.Y. that specializes in high-quality loose and herbal teas, and she plans on serving the traditional English breakfast tea, hot cinnamon spice, orange-lemon blend, peppermint and chamomile, among others. She said reservations for Mother’s Day or any occasion teas can be made by calling 937-402-8979 or through Facebook.